Retailer HMV is launching its new download store this month, taking on established online offerings from the likes of Apple and Amazon. HMV acquired digital delivery service 7digital in 2009 and the retailer's new website launching this week represents the first outcome of that deal. The download store will be fully compatible with PC and Mac, with HMV's Download Manager synchronising with a customers' iTunes library or with Windows Media Player. HMV's customers will be able to pre-order tunes, gift purchases to their mates and also be able to re-download previous purchases for free. "We are delighted tolaunch a world class download store that reflects bothHMV'smusic retailingheritage and our strategyto bea broad-based entertainment brand," said HMV's head of online and digital Sarah Hughes. "Our partners at 7digital have built for us a significantly improved new site that looks great and has never been easier to use. With so many innovative and wonderful features, it offers a truly intuitive and engaging customer experience that I very much hope will lead to HMV becoming a bigger player in the burgeoning digital market." 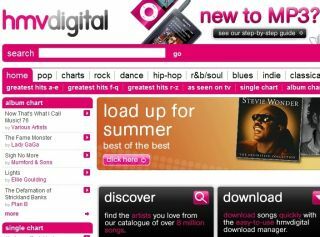 HMVdigital promises free tracks to selected early adopters, along with a limited time offer of 40p per track for all Top 40 chart tracks and Chart albums at an offer price of £4.99, with regular and ongoing discounts on classic albums and the chosen Artist of the Month.